Greensboro, North Carolina's Charlie Foxx and his sister Inez eventually found success in the music business as a team, but first they set out to make it separately. Charlie was the more musically inclined as a child; he sang with the Gospel Tide Choir, which Inez later joined. Heading to New York in 1960, little sis got the first break while Charlie, three years older, was still struggling to wedge his foot in a door, any door. Calling herself Inez Johnston, her first professional recording session was for Brunswick Records in the fall of 1960, just as her 18th birthday arrived. "A Feeling (That I Can't Explain)" was released without incident, in retrospect not greatly surprising as it was an unexceptional R&B ballad similar to other artists' efforts. Another Brunswick single came out in the summer of '61, then Inez found herself back on the street hoping to gain more experience in the record business. Sue Records owner Henry "Juggy" Murray used to tell the story of how the struggling pair approached him one winter 1963 day outside the Turf restaurant at 1650 Broadway. He said he thought Inez was "extremely cute" and Charlie was "very handsome" despite the awkwardness of a guitar he was carrying that had a broken string. They pitched an idea for a song and, impressed with such brashness and confidence, he invited them upstairs, several floors above the Turf, to the Sue offices where they sang "Mockingbird" on the spot. The tune's origin can be traced to a softly-sung children's song, "Hush Little Baby," specifically the opening lines 'Hush little baby don't say a word, mama's gonna buy you a mockingbird...if that mockingbird don't sing, mama's gonna buy you a diamond ring.' Bo Diddley had already messed around with the idea on his egocentric 1955 smash "Bo Diddley," spouting seemingly ad-libbed lyrics: 'Bo Diddley just buy his baby diamond ring...if that diamond ring don't shine, he gonna take it to a private eye...,' closing with 'have you heard? My pretty baby says she wants a bird!' Charlie and Inez stayed closer to the structure of the lullaby for their interpretation: 'Everybody have you heard...he's gonna buy me a mockingbird...oohhh, if that mockingbird don't sing...he's gonna buy me a diamond ring!' It had a rhythmic, in-your-face quality a world away from the original song and Juggy was sure it would be a hit if recorded exactly as the two had presented it to him. A session was set up with arranger Bert Keyes on the agreement that he wouldn't make any significant changes. Inez sang, Charlie answered and the back-and-forth wordplay resulted in a distinctively unique recording not everyone took seriously. 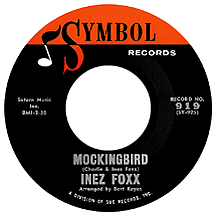 For reasons of his own, Juggy felt the record would do better if he positioned it as an Inez Foxx solo single (though Charlie and Inez were given equal writer credit for their changeup of the traditional tune, the origins of which are clouded at best). Once the song hit the radio, listeners and record buyers ate it up. Released on the Symbol label, a Sue subsidiary, it debuted in trade publications mid-June '63 and steadily made its climb, reaching number two on the R&B chart at the end of August (behind Little Stevie Wonder's "Fingertips - Part 2") while simultaneously entering the pop top ten. Charlie got his chance with a solo single, "Competition," an obvious Inez and Charlie number credited to Chuck Johnson (it's unclear whether Johnston, or Johnson, was a family name, or if the missing "t" from Inez's previous alias was a coincidence). The song didn't happen. Making Inez a star became Murray's main focus. "He's the One You Love" came next but struggled; the perception may have been that "Mockingbird" was a novelty one-shot. The Foxx siblings returned to the nursery rhyme concept for third single "Hi Diddle Diddle" ("...the cat in the fiddle"), and it charted briefly in December. After this they left the kid stuff to...well, kids. "Ask Me" was in and out of the charts in January 1964. "Hurt By Love" managed a two-month run in May and June. The records continued to credit Inez Foxx, ignoring the two obvious voices on every song. Charlie kept his ego in check, as he was really more interested in writing and learning the producing end of things. 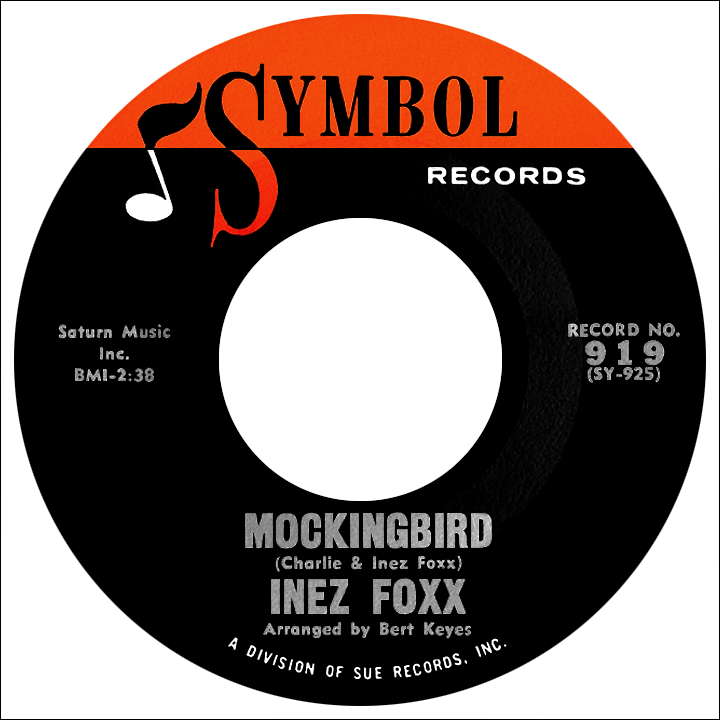 Five more Symbol singles were released, uneventfully, through early 1966 (including one as Inez and Charlie Foxx) before they parted ways with Juggy Murray. Immediately signing a deal with the Musicor label, Inez released "No Stranger to Love," sounding more mature than on earlier efforts. Her only Musicor 45, it received airplay on the growing number of full-time soul music stations that were popping up in larger markets. Then Musicor started Dynamo Records to focus on R&B artists, in the process granting them permanent billing as Inez and Charlie Foxx. Inez blossomed as a live performer during this time; she appeared more self-assured, acquiring a flamboyant wardrobe (she often donned a tiger-striped outfit) while Charlie supplied the backbone. Comparisons to the more seasoned Ike and Tina Turner were not unfounded. The second Dynamo single, "I Stand Accused" (an R&B hit for Jerry Butler in '64), reached the charts in the spring of '67. "(1-2-3-4-5-6-7) Count the Days" was their biggest single for Dynamo, going top 20 on the R&B charts at the beginning of 1968 while spending several weeks on the pop charts. Inez and former Scepter Records A&R man Luther Dixon, now plying his trade at Musicor, had married and were writing songs together. They collaborated on "I Love You 1000 Times," a hit for The Platters (the group's return to the charts after four years and first hit with lead singer Sonny Turner). Charlie was doing more writing and producing for other acts, notably Gene Pitney; he cowrote Gene's 1968 hit "She's a Heartbreaker" with Jerry Williams. Inez and Charlie Foxx grew apart as an act in the early 1970s. She belted out one final R&B hit for Dynamo, "You Shouldn't Have Set My Soul on Fire," in 1971. Her solo career was reignited two years later at Stax Records in Memphis with a series of releases on the Volt label, including a revival of Mitty Collier's "I Had a Talk With My Man" in 1973 and "Circuits Overloaded" in '74, among others. So you see, both sister and brother, together and separately, found success far beyond their incorrectly tagged "one hit" status with "Mockingbird." The souful lullaby, by the way, reached the top ten a second time in 1974 when Carly Simon (with then-husband James Taylor) remade it, feeling the Foxx influence for sure.